The pain started in my thumb and then spread to my palm and the outer edge of my hand. Throb, throb, throb. Pretty soon my whole hand was aching. My first bee sting of the year. And welcome to Spring. It seems like an early Spring this year – I don’t remember working on my garden until May Long most years, but I’m definitely not complaining. With my master’s degree work being thisclose to finished, I’ve been trying to think about how I want to spend my new free time, a combination of relaxation and productivity. It’s hard to think what I did with my time before I started my degree – I imagine all I could have accomplished, and then I remember all the TV I used to watch. Spending extra time on my garden is pretty high on my list, and lucky for me, it sits in both the relaxing and the productive columns! 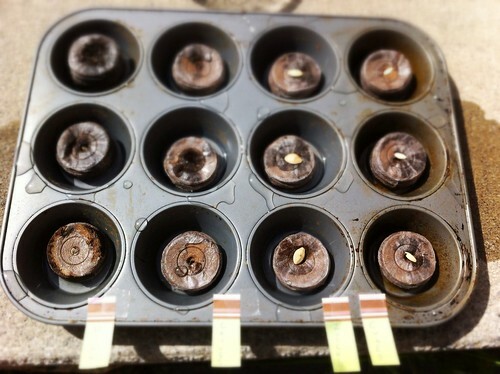 For the first time, I’m starting some seeds in peat and in the house before planting them in the ground. Still not trusting the temperature won’t dip a lot overnight. The muffin tins contain dill, chives, zucchini and cucumbers. For whatever reason, I’ve always had a hard time growing chives — and yes I know they’re supposed to be one of the easiest to grow and then one of the most difficult to get rid of. If you have tips, please let me know! As is usual, the rhubarb is already exploding, without any effort on my part. I cleaned it up nonetheless, along with the little strawberry patch behind it. Here’s to strawberry rhubarb pie and rhubarb mojitos in the summer! 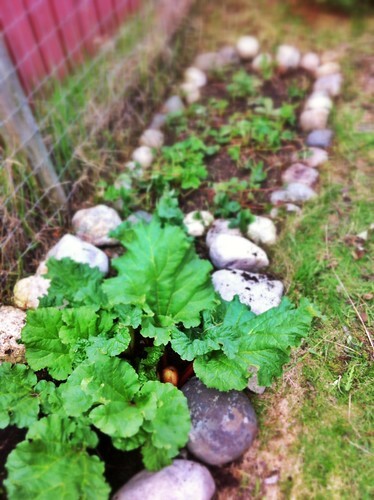 This entry was posted in general and tagged gardening, rhubarb, strawberries on May 6, 2012 by Jessica Quinn.